2013 Star Trek Hallmark Ornaments Preview – Sneak Peak! During the 2012 Comic-Con International in San Diego, Hallmark gave a sneak peek of three new Star Trek Keepsake Ornaments that will be released in 2013. Among the three Hallmark Keepsake Ornaments previewed, it is pretty safe to say that the most anticipated ornament will be the Star Trek Legends #4 ornament, Chief Engineer Montgomery Scott, as Star Trek Hallmark ornament collectors have been almost begging Hallmark for years to recognize the miracle worker of the NCC-1701. So, with no further a due, here is the sneak peak of the 2013 Hallmark Star Trek ornaments. Chief Engineer Montgomery Scott – Scotty, sporting his red uniform from The Original Star Trek Series, will be #4 in the Star Trek Legends Hallmark ornament series. 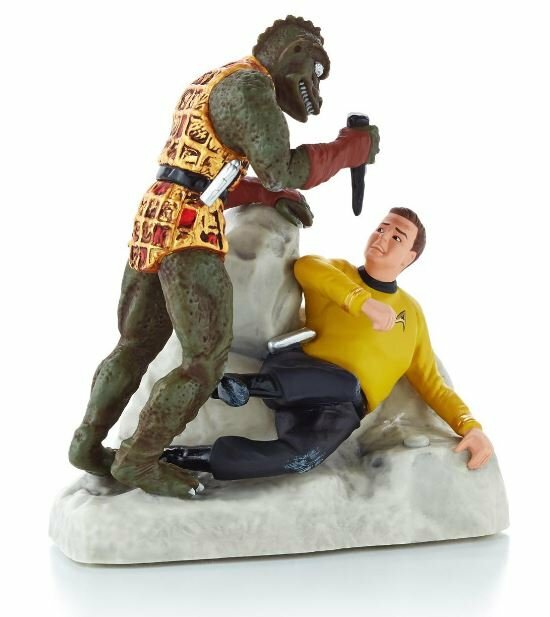 “Arena” – The Gorn captain and Captain Kirk battle it out in this upcoming ornament that also features the epic sound and music from their iconic TOS battle scene. U.S.S. Kelvin – The doomed starship from the 2009 feature film, Star Trek, was captained Lieutenant Commander George Kirk (James T. Kirk’s father) during her last moments before being destroyed by Romulans from the future. 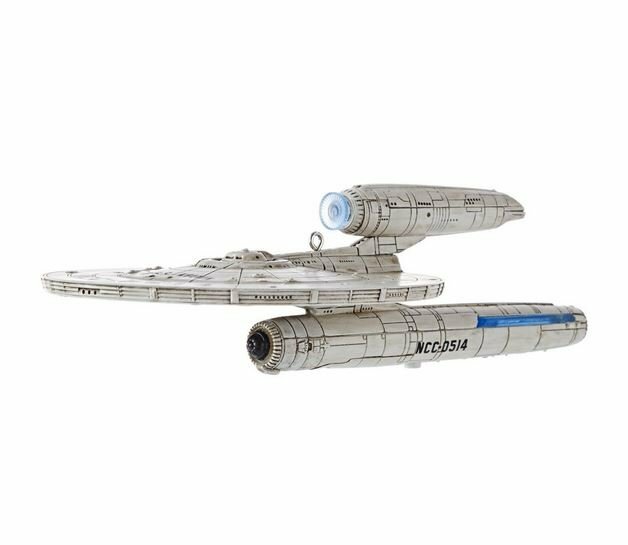 It will become the newest addition to the unofficial Star Trek ships Hallmark Ornament series. The ornament will have battery-powered lights, just as most of the other recent Star Trek ships. In July 2013, if you are interested in purchasing these ornaments, they will be available at www.hallmarkornaments.com. 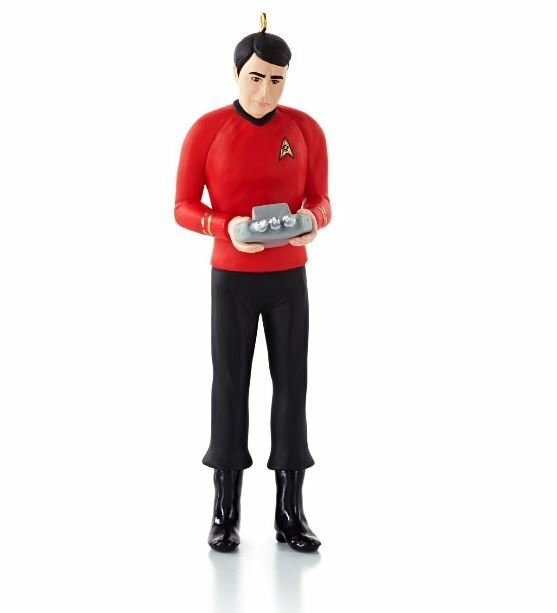 If you are interested in buying any of the 2012 Hallmark Star Trek ornaments, or any of the other Hallmark ornaments from the Star Trek series, be sure to go to https://www.hallmarkornaments.com/Star-Trek_c_204.html for the best selection and some of the lowest prices online. A Christmas tree is an iconic part of the holidays, and many families delight in passing ornaments down from one generation to the next while creating memories together with these special collectibles. For many, ornament collecting is an integral part of the Christmas celebration, and Hallmark ornaments are some of the best-known and most coveted collectible ornaments available. Each year, new Hallmark ornaments are released for a limited time; once they’re gone, these collectibles are no longer produced. Ornaments become available in July and many newly-released collectibles are part of a series continued from previous years. This allows avid collectors to obtain all of the parts of a single series if they wish. The 2012 Hallmark ornaments include new additions to existing series as well as brand-new ornaments on a variety of themes. There are 50 ornaments altogether in the 2012 Hallmark ornament collection. Among them are several rare collector’s editions with a limited release, including the commemorative Kansas City event Hallmark ornament and the specialty San Diego Comic Convention (SDCC) Hallmark ornament. Hallmark ornament collectors will appreciate the wide variety of ornaments available. Themes range from pop culture icons like Tom and Jerry, Tinkerbell, Iron Man, and Captain America to classical designs like peace doves, snowflakes, and angel messengers. Other ornaments include animal-based designs, themed ornaments based on age, career or family status, and photo frame ornaments. The prices for the 2012 Hallmark ornaments vary and some are rarer than others. The priciest ornament on the 2012 Hallmark ornament list thus far is the San Diego Comic Convention 4-LOM and Zuckuss Star Wars Hallmark ornament; a very rare ornament that was limited to only 1,000 units produced! Prices vary depending on rarity, with special event and limited edition Hallmark ornaments costing the most. Whether a collector simply wants to add a single Hallmark ornament each year or plans to purchase an entire set of Hallmark ornaments, there’s a wide selection of ornaments available to appeal to people of all tastes. A wide collection of themes ensure that collectors will find something of interest to them, and there are ornaments at multiple price points to ensure that no collector is unable to participate. To view the exciting new line of 2012 Hallmark Ornaments, get hooked on The Ornament Factory today by clicking here (www.hallmarkornaments.com) or calling 1-888-740-6970! Note: We are a secondary market dealer of Hallmark® Ornaments. We are NOT affiliated with Hallmark Cards, Inc. 2012 Hallmark Ornaments will NOT be available until after the 2012 Hallmark Ornament Debut, July 14-15, 2012!